Tag line: "He'll kill you on a moment's notice!" Any day I watch a Boris Karloff film is a good one, and even though he’s absent for the first 20 minutes or so of 1937’s West of Shanghai, he still manages to dominate the screen, delivering what may be the weirdest performance of his career. Eager to swing a deal that would partner his company with a large oil field in North China, Gordon Creed (Ricardo Cortez), a salesman working abroad, hops a train heading in that direction. To his surprise, a rival oil man, Myron Galt (Douglas Wood) and his daughter Lola (Sheila Bromley) are also on the train, traveling to the same locale. After having dinner together, the three head to the railroad car that Creed is sharing with General Chow Fu Shan (Vladimir Sokoloff), the top man in the Chinese army. As Creed and his guests chat the night away, the lights suddenly go out, and when they come back on, the trio realizes General Fu Shan (who was sleeping) has been stabbed in the back, and is dead. The local police, who are investigating the incident, question Creed, Galt, and Lola, all of whom are cleared of any wrongdoing, but it’s a nerve-racking start to their journey all the same. Things aren’t much better at the oil field. For one, the American who runs the operation, Jim Hallet (Gordon Oliver), is in love with Creed’s estranged wife, Jane (Beverly Roberts), causing some tension between the two men. What’s more, a revolution has broken out, which allows rebel General Wu Yen Fang (Karloff), the man responsible for Gen. Chow Fu Shan’s assassination, to take control of the entire area, including the oil field. A charming, yet highly unpredictable warlord, Wu Yen Fang quickly alienates the American visitors when he attempts to seduce Jane, but a past encounter the General had with Jim Hallet might just save them all from the firing squad. The opening scenes of West of Shanghai, before Karloff makes his grand entrance, are serviceable, though not spectacular (even the assassination of Gen. Chow isn’t much of a mystery; we watch the killer sneak on the train just before it pulls away). Fortunately, things liven up when Karloff's General Fang hits the scene. While he’s not the least bit convincing as an Asian military leader (his accent is laughable at best, and at worst, racist), Karloff is so charismatic in the role that he steals the movie right out from under his less-talented co-stars (some of the supporting performances are bad, bad, bad!). In fact, there were times throughout the picture when I was sure Karloff believed he was making a comedy (when looking over the American women, Gen. Fang insults Lola’s hair and mouth, which he says is as wide as a fish’s; and he always refers to himself in the third person, usually doing so with a bit of flair). 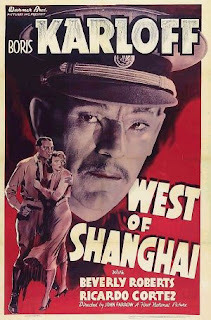 West of Shanghai doesn’t rank as one of Karloff’s best films, but if you want to see him camp it up a little (and do so with plenty of style), this is the movie for you.